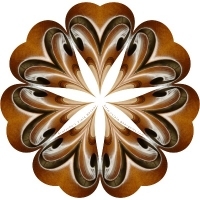 This 7-petaled mandala, somewhat resembling a flower, is actually based on a closeup photo of a gracefully fluted f-hole of the designer’s own viola! Further, its kaleidoscopic angle slightly “suggests” an alto clef as well. Artistically rendered, this beautiful design is sure to please any violist! Buy this design now on any t-shirt, hoodie, tote bag, mousepad, mug or other quality apparel or giftware, exclusively from Bratsche’s Viola Bazaar!